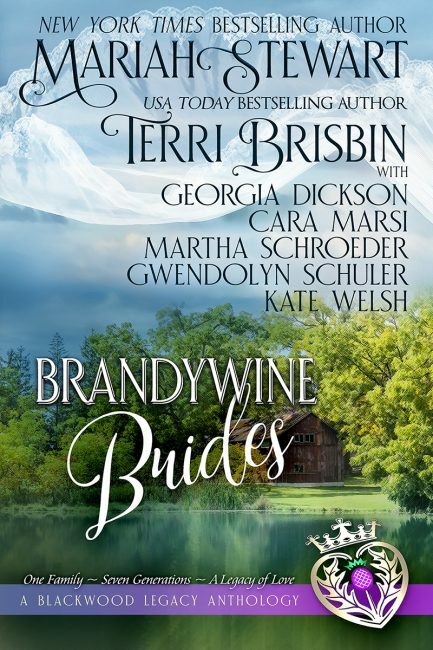 April 25th, 2017 by Terri Brisbin & filed under Uncategorized | Comments Off on Brandywine Brides are here!! It is suc h a good feeling when a book is released and it gets in the hands of readers. This project is near-and-dear to me since it involves a group of my friends who decided to create a project together. It’s been happening over a couple of years and now it’s here! Seven stories about seven generations of one family that begins with a Scottish traitor transported to America and those who come after him….all the way from 1721 to present day! NYT Bestselling author Mariah Stewart is our lead author and the others include Cara Marsi, Kate Welsh, Gwendolyn Schuler, Martha Schroeder and debut author Georgia Dickson… and me!